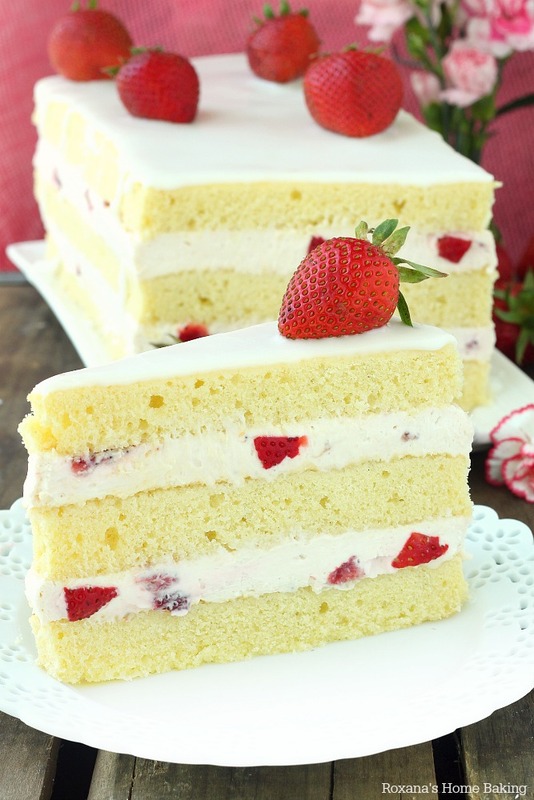 This strawberry shortcake cake is a lovely change from the traditional strawberry shortcake. 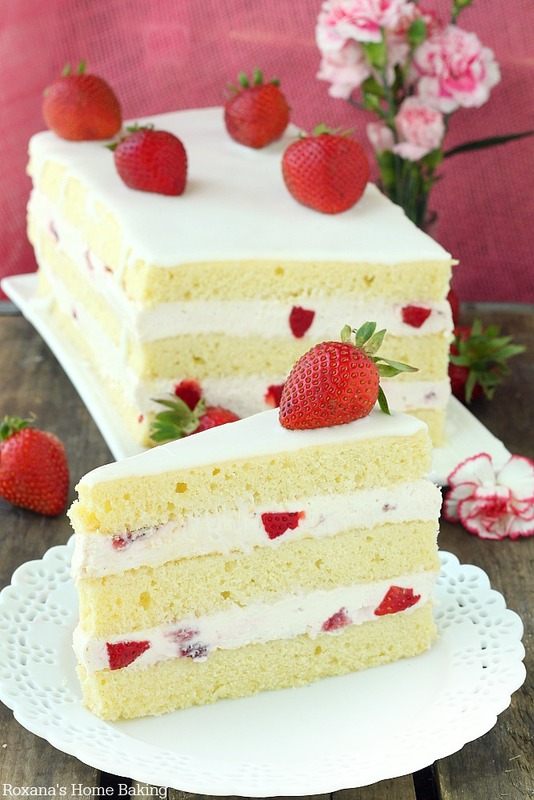 Layers of rich buttery cake filled with smooth cheesecake and chopped fresh strawberries. So far this year I’ve made classic strawberry shortcakes, strawberry ice-cream, lots of strawberry smoothies and made a few times these chocolate strawberry cookie bars. The idea of combining a buttery cake with a strawberry cheesecake filling came to me recently. Now this cake may look a little intimidating, but trust me, it’s not. If you think it’s too much work to do the three layers, just go with two. 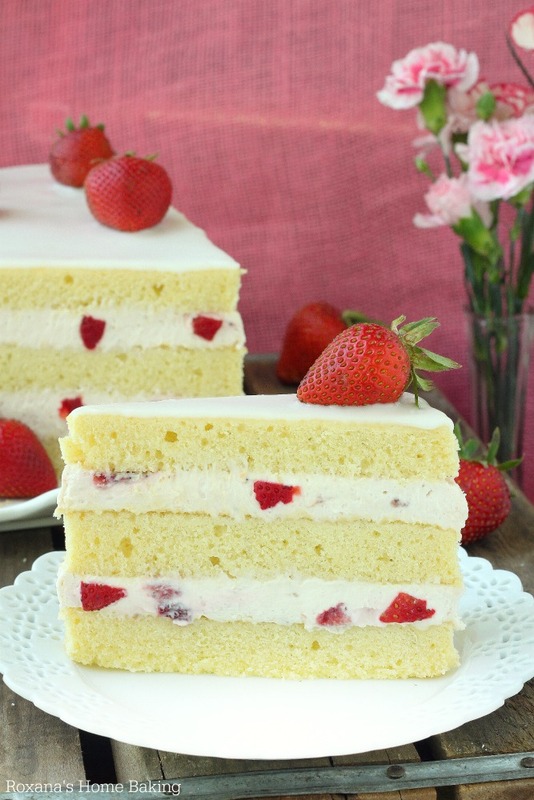 Either way, if you love strawberry shortcake, you’ll love this cake! To make this cake I started with my favorite pound cake recipe. This pound cake saved me so many times and used it countless time for various occasions. I’ve baked the cake in two round 8 inch pans, in a 13X9 inch pan and this time in an 17X11 inch sheet pan. Like other pound cake recipes, you start creaming the butter with the sugar. Lots of butter. 3 sticks to be exact. Yes, this cake is buttery and oh so good!! Half dozen of eggs are gently beat in before the flour is added. The batter is quite thick, you’ll need a spatula to spread it in the prepared baking pan. While the cake is baking, it’s time to do the best no-bake strawberry cheesecake! Of course you can use whatever filling you like. 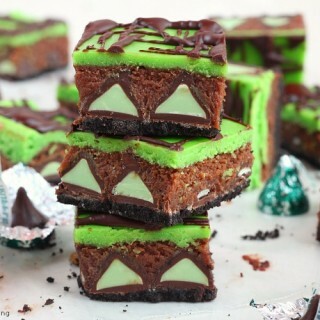 Chocolate, mint, caramel, vanilla – go crazy! To make the strawberry cheesecake filling you must start with bright red, plump, and firm, with little or no white “flesh”. I usually check the underside of the container to make sure there are no squashed berries. I get so frustrated when I get home and find a soft, squashed berry in the center of the container <- one of the reason I almost never buy berries in a 2 pound container. I can’t see all the berries inside. You’ll also need cream cheese, sugar, strawberry preserve and cool whip. No baking required, just mix, chill and fill the cake. Preheat the oven to 350F. Line a 17X11" baking pan with parchment paper. Set aside. In a mixing bowl add the butter and sugar. With the paddle attachment on, beat on low speed until light and fluffy, about 5 minutes. Alternately, add the flour, baking powder and milk, stirring until just combined. With a spatula, spread the cake batter evenly in the prepared pan and bake in preheated oven for 23 to 25 minutes. Remove from the oven and let the cake cool in the pan for 10-15 minutes before inverting on a wire rack and cool completely. While the cake is baking, make the cheesecake filling. In a mixing bowl add the cream cheese, sugar and strawberry preserve. Beat on low speed until well blended. With a spatula, fold in the cool whip and diced strawberries. Place the cheesecake in the fridge and cool for about 1 hour. To assemble the cake, cut the cake on the short side in 3 equal slices. Place half of the strawberry cheesecake over the first layer and spread it evenly. Arrange the second cake layer over the cheesecake filling and top with the remaining filling. Top the cake with the third cake layer and press gently to level it. Refrigerate for about 1 hour before cutting into slices. Optional, decorate the cake with icing (powder sugar mixed with few drops of water) and fresh strawberries. 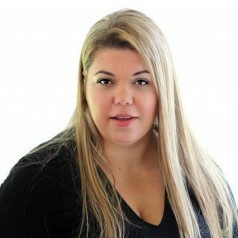 Hi Roxana! The cake looks wonderful and I can't wait to try it out...I have strawberries in the fridge just waiting to be used! Would you mind to tell me what kind of icing you used on top of the cake? Thanks! SO beautiful! That slice of cake has my name written on it!! WANT! This my dream summer dessert. I can almost taste the cake already. I need a slice of this cake!! I've got the cream cheese just need the strawberries! Pound cake is my favorite type of cake, what a wonderful idea of using it has the cake for a Strawberry Shortcake. I can not wait to try this recipe out. Thank you for sharing with us. 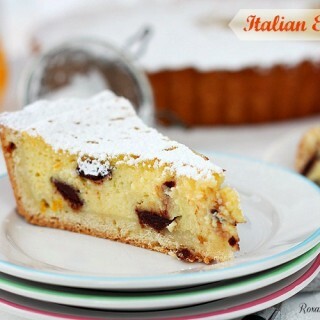 Another beautiful and tasty recipe! Of course, the strawberries give it an extra touch of fresh too! This looks so beautiful. Also, your white plates resemble doilies, which is pretty cool too. Thanks for posting. Hi Julie, Thanks! I have the plates from Pier 1. I don't know if they still carry them. You may wanna pay them a visit. 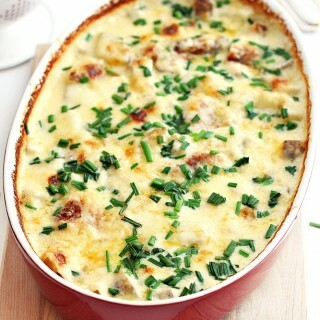 Hi Roxana: Absolutely beautiful looking recipe but I need some clarification please. When you say strawberry preserve, do you mean a jam, or a type of preservative. Looking closely at the pictures the filling is so white I can't imagine a jam type ingredient being in there but that is what seems to make sense. I really want to make this next weekend, thanks so much for posting!! Hi Catherine, It's strawberry jam. 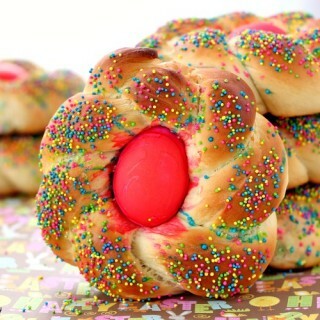 I don't know why the filling is not as red/pink, maybe it depends on the quality of jam. I use store-bough jam. Roxana, this looks so yummy! Growing up, we'd head to the strawberry festival each year and gorge ourselves on all kinds of strawberry foods. If this had been there, I think it would definitely be the first choice on the list. Looks fab! This looks amazing!! Can't wait to try it. Thanks for sharing. I found your link over at wine and glues wake up Wednesday link party. Beautiful in every way! Love. Love. Love. Pinning. Why did I have to start this diet before I saw this?! 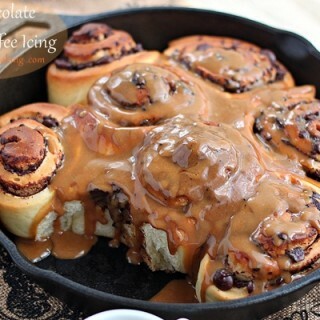 I promise you this is one of the first treats I am going to make for myself, when my diet is ready for a break! This looks so very delicious, and I love strawberries. 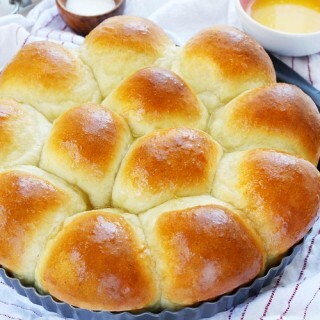 Thank you so much for this fantastic recipe! This is absolutely gorgeous. Thanks for sharing. Hello from Best of the Weekend Party! 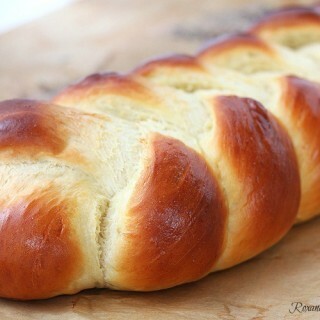 Im making this for today! cake is in the oven as I type the filling is AMAZING!! cant wait to see the finished product!! Thank you so much for posting!!! Do you have any idea how far ahead can you make this? One day? Same day? I know the fresh strawberries make it a bit tricky. Same day would be tough if you are doing a big dinner party. Thanks for any suggestions! It is a nice twist on an old standby! Hi Jenene, You can bake the cake (the pound cake) up to 3-4 days in advance, but the strawberry filling must be made the day it's served or the night before the dinner. Your strawberries will soften and lose their bright red color if you let it sit longer. This looks like such a delicious and fresh cake for summer! I love using fresh strawberries in desserts, especially when it comes to strawberry shortcake - my favorite!! :) Pinned! This looks delish! My question is about the assembly instructions. You say to cut the cake on the short side in 3 equal slices. Can I assume this means cutting it from front to back? Or can I lay it down on the long side and slice it that way? Can I use two 9 inch cake pans? If so, what are the baking times? Hi Maddie, I have not baked this cake in two 9 inch round pans, but I have tried other cake recipes in both pans and they turn out just as good. As for the baking time, it takes a few few more minutes longer than a jelly roll pan. I would suggest checking for doneness around 18-20 minutes and go from there. This looks wonderful! I do have a few questions about the cheesecake icing please. Is the 3/4 sugar POWDERED / CONFECTIONERS or just regular Sugar? And, what does 3x8 oz cream cheese mean? 3 blocks of cream cheese? Can't be! Thanks for helping me! I can't wait to make this for my co-workers.